Why does Trial Experience Matter? There are many lawyers out there. Most cases settle. Does it matter whether the lawyer I choose has tried cases? 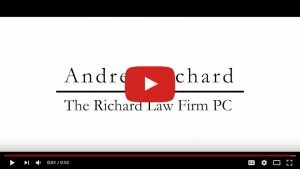 We asked Andrea Richard of The Richard Law Firm to find out more. What Do You Love Most About Practicing Law? The information on this website is for general information purposes only and viewing this information does not create an attorney-client relationship with us. Nothing on this site should ever be relied on as specific legal advice. Copyright 2017 The Richard Law Firm. All Rights Reserved.